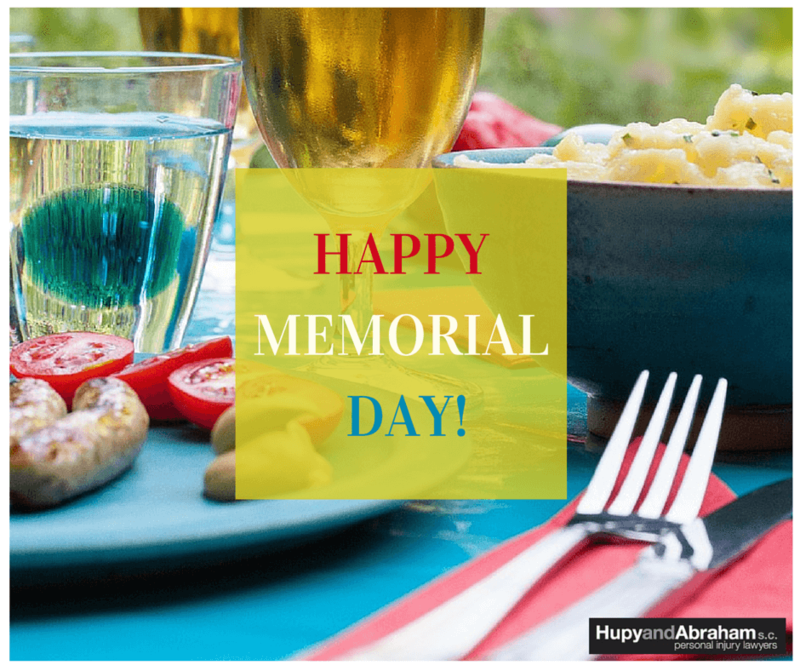 Five Tips for the Best Memorial Day Party | Hupy and Abraham, S.C. This year, Memorial Day will fall on Monday, May 30, and for many families that day signals the official beginning of summer vacation. Most Americans will spend the long weekend with friends and family, paying respect to service members. It’s also not uncommon to also celebrate with a party or picnic! Throwing the perfect bash can be easy with the right combination of fun and food, so here are a few tips for a safe and festive Memorial Day get-together. Serve great food – The key to a great party is almost always the food, so have a little fun with a variety of red, white and blue snacks and sides. Just remember to practice food safety to prevent guests from getting sick. Ensure that hot foods remain hot and cold foods remain cool, and avoid any and all cross-contamination. “Cool” foods that have been sitting out for more than an hour or two should be thrown away. Fire up the grill – Memorial Day and grilling out is often synonymous, and offers a great opportunity to avoid using the oven and keep the house cool. Hot dogs and burgers are a quick and easy option, just be sure that meats like beef, pork and chicken are thoroughly cooked to a minimum of 160 degrees. Also be sure to keep an eye on kids who may be playing nearby. And, always keep a fire extinguisher handy in case of accidents. Mix up refreshments – Thrill your guests with your mixing skills by creating one or two signature drinks for your party. Though in consideration of children, or guests who choose not to drink, make sure to include some nonalcoholic options, as well as plenty of water. Drunk driving is a serious issue during the Memorial Day weekend, and your guests will appreciate you for looking out for them. Cool off in the pool or lake – There’s nothing more fun than a pool party or day at the beach, especially with friends and family. Pool games can be fun for kids and adults alike, and if your child is in the water, it’s a good idea that you are as well. Just make sure to remind kids to always walk, not run, near the pool and to wear a life jacket in any body of water. Get patriotic – The perfect ending to any Memorial Day party is a few patriotic fireworks. If you live in a city or neighborhood that permits you to put on your own show, enlist one adult to be in charge of lighting them, and teach children to keep their distance. As an extra precaution, keep a bucket of water nearby, and soak all spent fireworks before they are thrown away to prevent a fire. Sparklers can also be a fun addition to a party, but should not be held by children younger than 10. At Hupy and Abraham we are big advocates of being safe while having fun, and hope that you and your family have the best possible holiday weekend. But in the event you are injured do the unsafe actions of another this Memorial Day, please contact the experienced personal injury attorneys at Hupy and Abraham. Call 800-800-5678, or start a live chat anytime at Hupy.com.